Where does Kelley's Heroes perform? 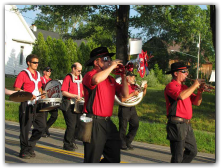 We perform mostly in parades including many local fire department parades and carnivals, as well as several local bigger parades and festivals in Rochester and surrounding areas. Check out our schedule for a full list! How much does it cost to join the band? Joining the band costs nothing. What kind of clothing/equipment will I need? You will need your own black shoes, black socks and black pants. The band will supply a shirt/sweatshirt and hat. The band will also provide all music and a flip folder and blank windows to hold music if needed. And of course, you will need your instrument (except percussion and colorguard... see below)! What if I want to join but do not own or have access to the instrument/equipment I need? Let us know! We might be able to help you out! We do have percussion instruments and colorguard equipment for those interested. Are there any rehearsals? Are they mandatory? We currently have a few rehearsals planned to kick off the new season. Check out the "Schedule" link above for more information. Rehearsal attendance is not mandatory but we play between 30 and 40 songs throughout the season. Attendance would be beneficial to most. I'd like to join the colorguard but I've never done it before. What does it involve? Colorguard members have several options. We are usually in need of banner carriers. 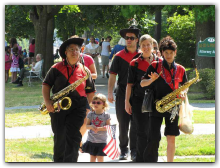 These members walk in front of the band holding either end of the banner and set the pace for marching. Members may also carry a flag (American, state flag, something else symbolic depending on the event) or even be a part of the visual component of the band by learning a routine. There's something for everyone! How many performances do I have to attend? You can attend as many performances as you'd like! We encourage at least 5 to help make sure parts are covered, but we value any amount of participation you can offer! Will I get paid to be in the band? 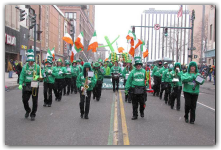 Kelley's Heroes does not pay members to perform on a per-parade basis. However, members who attend at least 5 performances are eligible to go on an all-expenses-paid overnight trip to Toronto in mid-November for the Toronto Santa Claus Parade! What is so special about the Toronto Santa Claus Parade? 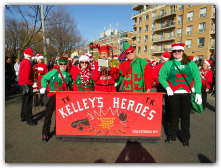 Kelley's Heroes has participated in the Santa Claus Parade for over 20 years! The parade is over 3.5 miles long and goes through the middle of Toronto. Over half a million people attend! Not only that, but free travel, lodging and food makes for a fun weekend away! Click here to go to the official Toronto Santa Claus Parade.